Welcome to a somewhat new direction for the Coffee Spot as we head off into the unknown with Brian’s Travel Spot. As my followers on twitter may already know, I’ve just embarked on a three-week adventure across the United States. The aim of this little (well, not so little by the time I’ve finished it) piece is to keep a record of what I’ve been doing. The idea is that it enables you, dear reader (Or should that be dear readers? Perhaps I’d better not be too ambitious and stick with dear reader for now. ), to follow my adventures as they unfold. I’ll update this post every few days, in between my normal Coffee Spot posts, the idea being to capture the highlights, with the emphasis on the travel rather than the coffees shops (although I’m sure they’ll feature). I’ve never tried my hand at travel writing before, so it could be an adventure in more ways than one! So, if you’ve made it this far, take the plunge, and come along with me as I traverse the USA! Each update has its own gallery and then a short (I hope!) entry underneath. You can see how my journey started after the gallery. I arrived at Heathrow Terminal 5 on Sunday evening, ready for my British Airways flight to Boston and the start of my amazing adventure. My three previous flights to/from the USA have been on brand, spanking new Boeing 787s, so it was with something of a jolt that I realised that this time I’d be slumming it on a humble old Boeing 777. However, that’s rather unfair on the poor 777, since it was a very well-appointed aircraft, with at-seat power at all the seats, even at the back in cattle class (err, I mean, economy). At-seat power has revolutionised the way I fly. Well, at-seat power and my Aeropress. Gone are the days of sitting on the flight, watching movies on a little screen in the seat in front of me. These days I get the laptop out and work pretty much the entire flight, either at the day job or writing Coffee Spots. It’s meant that I can justify spending the £30 – £50 extra on an exit row seat so that I can actually use my laptop, revelling in having enough space to stretch my legs and put the laptop where I can properly type. Five or six hours of dead-time has just turned into five or six hours of productive time. My flight over was pretty good. We left the UK at 7.45 in the evening and arrived in Boston at 10.00 local time after seven hours in the air. This meant, as you will have seen from the gallery, that we had an extended sunset, with the sun slowly sinking below a horizon formed by a pretty unbroken bank of cloud. You can find out what happened when I arrived in Boston after the gallery. Boston has gone out of its way to make me feel at home. When I first came to Boston in the autumn of 1998, it rained for four straight days. Since then I’ve only ever been back in the winter, when it’s usually below freezing and/or snowing. This time, I thought, it will be different. Early summer; long, warm days; it will be glorious. Wrong. I was greeted by the coldest ever 1st June on record and almost continual rain, some of it horizontal. Just a typical, British summer’s day. It was like I’d never left home. I hadn’t gone to bed the evening before until 1.30, so I slept in and didn’t leave the hotel until gone 10 o’clock. In an ideal world, I’d have gone to Charlie’s Sandwich Shoppe, but it had closed down last year. I did swing by in the vain hope that it might have re-opened, but it was well and truly shut, although deep inside there were sounds of construction, which turned out to be part of a complete refit. Much to my delight, when I returned to Boston in February 2016, I found that Charlie’s had reopened, as good as ever! Instead I headed to the nearby Render Coffee, a find from last year’s trip , where I had a breakfast bagel and a cappuccino. From there I moved on to the Pavement Coffeehouse on Gainsborough. The previous year I’d written about the original Pavement Coffeehouse on Boylston and although I’d stuck my head around the door of the Gainsborough branch, I’d not had time to write it up. I ended up staying there for about three hours, during which time I met up with the owner, Larry, and interior designer, Lana, who’d done all six Pavement stores. Indeed, I’m indebted to Lana for setting up the whole meeting. We spent an hour chatting about coffee, coffee shops and coffee shop design. I also learnt the story of how Larry went from baking bagels to owning a chain of six successful coffee shops. The weather did put a significant dent in my plans though. I had a ticket to see the Red Sox play (baseball) at Fenway Park, but the game was rained off, so I used my spare evening to catch up with my old friend Jeff, who I’d first met on my original trip to Boston back in 1998. You can see whether it stopped raining after the gallery. Tuesday dawned grey and still raining, ready for my day trip on the train to Providence, Rhode Island. 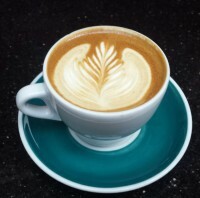 It turns out that Providence has a pretty decent coffee scene. Who knew? Not me, that’s for sure. That I discovered it at all is entirely down to Allison, who I met on twitter and who, through a combination of persistence and, well, persistence actually, got me to make the trip. Allison, who with her partner Chris, runs the blog Broke and Travelling, acted as my host and guide for the day, ferrying me around (in the rain) between various Coffee Spots, much in the way that Greg of Coffee Guru App fame does when I’m in Philadelphia. I’m truly blessed by the kindness of others. We tried a number of Coffee Spots, including Coffee Exchange, which is already on the Coffee Spot, plus Dave’s Coffee Co. and the wonderfully-named The Shop. You can see more of what we got up to in the gallery. I’d only ever been to Providence once before. That was over 10 years ago when I was there for a day with a group of friends, one of whom, Dirk, had downloaded an HP Lovecraft walking tour (for those that don’t know, HP Lovecraft was a horror writer, active between the wars, who lived in Providence and got much of his inspiration from the city). The tour started well, with places where HP Lovecraft had lived or frequented, as well as buildings which inspired his writings. Back in the present day, the rain cleared up towards the end of the day, which allowed me to take a pleasant walk from my final stop, The Shop, back to the station, where I had just enough time to pop into The Arcade Providence, America’s oldest covered shopping mall, and visit New Harvest Coffee & Spirits. Those regular readers who know my love of Coffee Spots in Victorian shopping arcades will understand how much I appreciated that (although technically, the Arcade is Georgian)! You can discover whether I fulfilled my long-standing ambition to see a ball game at Fenway Park after the gallery. Back in Boston, the day dawned cloudy, but there was a hint of blue skies somewhere between the clouds. First order of the day was breakfast. Although I was enjoying visiting some of my favourite cafés for breakfast, I was missing my eggs and griddle cakes from Charlie’s Sandwich Shoppe. However, my lovely hotel, the Chandler Inn, had started doing breakfasts since I’d last stayed there, so I gave it a go and was pleasantly surprised. My breakfast of poached eggs, potatoes and pancakes was not only very tasty, but the portions were sensible sizes too! As a thank you to Allison, I’d carefully selected some coffee from Glasgow’s Dear Green Coffee, a roaster I was fairly sure hadn’t made it to Providence. I’d hauled said coffee over the Atlantic and then left it in my hotel room the previous day. Well done me! After a quick stop at the post office, where the coffee was entrusted to the loving care of the United States Postal Service, it was onto the first business of the day, catching up with my friend Anne at True Grounds, a coffee shop she had first put me onto a couple of years ago. The game I’d been planning on attending on Monday evening had been rescheduled for that afternoon, so at 1.30 I turned up at Fenway to watch a ball game. I’ve seen a couple of games before, at Wrigley Field in Chicago, but it’s not a game I’m that interested in. I’ve tried watching games on television, but I find them deathly dull; however, there’s something about the spectacle of a live game that I find fascinating. I suspect that I’d even enjoy a football (soccer for my American friends) match if I could be bothered to go to one. I suspect that a baseball game is as confusing to the uninitiated as, for example, a game of cricket would be. I was surprised at how much I remembered from the games I’d seen in Chicago, but there were still passages of play that had me scratching my head. What fascinates me most is the ritual that goes with the game. For somewhere that entitles itself the “Land of the Free”, much of American society seems very rigid to me, a good example being the singing of certain songs (“Take Me Down to the Ball Game” for example) at specific points in the game. I’m sure familiarity plays a part. I suspect cricket has similar rituals that seem strange to the uninitiated, but growing up with the game, they’re second nature to me. Anyway, I thoroughly enjoyed my afternoon at the ball park. The Sox won, by the way. I had time after the game to wander over to Cambridge to visit Dwelltime (now called barismo 364) and L.A. Burdick in Harvard, as well as taking a turn around Harvard Yard at sunset. After the gallery, you can see what happened when I left Boston, and headed on up the coast to Portland. As you might have worked out by now, nothing much has gone to plan on this trip. I’d planned to take a day trip to Portland, going up by bus in the morning, returning by train in the evening (originally the idea was to do the whole trip by train except, due to engineering works, there were no trains, in either direction, in the morning). Come Monday, Amtrak called to inform me that my evening train had been cancelled as well. However, I ascertained that there would be a train the following (Friday) morning, so a quick rescheduling saw me cutting my stay in Boston short by one night (thanks to my lovely hotel, the Chandler Inn, for not charging me the extra night) and booking a hotel in Portland instead, at the equally lovely Inn on St John. In the end, it worked out in my favour; hotels in Portland are a lot cheaper than those in Boston! I’ve not travelled by long-distance bus in America for at least 10 years, so I was pleasantly surprised to find that my coach had Wifi and movie screens coming out of the ceiling at regular intervals (showing, of all things, “The Sound of Music”!). I concentrated on watching the scenery whiz by, which was mostly trees as we headed first up Route 1 and then I95. I’d driven up from Boston to Portland a couple of years ago, going along the coast itself, which was far more dramatic, but also took all day! This, in contrast, was a shade under two hours. When we got to Portland, the gentleman I’d been sitting next to, and with whom I’d exchanged maybe 10 words all trip, asked me if I need a ride anywhere. After ascertaining that I was only going to the Inn on St John, I politely declined, partly because I didn’t want to impose and partly because I wanted to walk the route so I’d know how long it would take (and know which way to go) when I went back to the station the following day. As it turned out, I’d not counted on America’s love-affair with the car, which meant that sidewalks and sensible walking routes were few and far between. My major challenge was getting across the freeway which was between me and Portland. Frustratingly, I went the wrong way. I’d have got there in the end, but I went right instead of left in my quest to get past the freeway. I was wandering along when who should drive past in his pick-up, but my new-found friend from the bus. He stopped and this time I didn’t turn down his offer of a lift. Five minutes later, Joel (we managed to exchange names this time around) dropped me off at my hotel and was on his way again. As I said, I’m blessed by the kindness of others. My day in Portland was spent visiting (you guessed it) coffee shops. It was, however, dominated by smells. First, I visited Tandem Cafe & Roastery, where I got rather high on the smell of freshly-roasted coffee. Later on, I was at Tandem Coffee + Bakery, where I got even higher on the smell of freshly-baked bread and cakes. Finally, I rounded off my day with a fried oyster bun at Eventide, where the smell made me feel I was sitting on the beach with the sea lapping at my feet. In between, I also squeezed in visits to Bard Coffee and Speckled Ax. So that concludes the first part of my adventures. If you want to see what happened next, part two of Brian’s Travel Spot covers my long journey westward. This entry was posted in Boston, Brian's Travel Spot, Portland (Maine), Providence and tagged Boeing777, BritishAirways, Flying, PortlandPortland1 by Brian Williams. Bookmark the permalink. I know, I know… I didn’t plan this end of the trip very well. One day I promise to come over and do things properly. Having taken the HPL walking tour myself, I was very entertained by yours and Dirk’s comments 🙂 Providence is a lovely place, though, isn’t it?